For the last eight years we have been extremely fortunate to be able to host Richard Levitan for a state-of-the-art, cutting-edge annual airway workshop. We learnt about epiglottoscopy, correct head positioning, NODESAT and the mindset of and airwaynaut when all those concepts where only known by a chosen few; all thanks to Rich's brilliance. We are supporters of Free Open Access Medical Education, and this year we will be able to share some of this magnificent knowledge with the world. 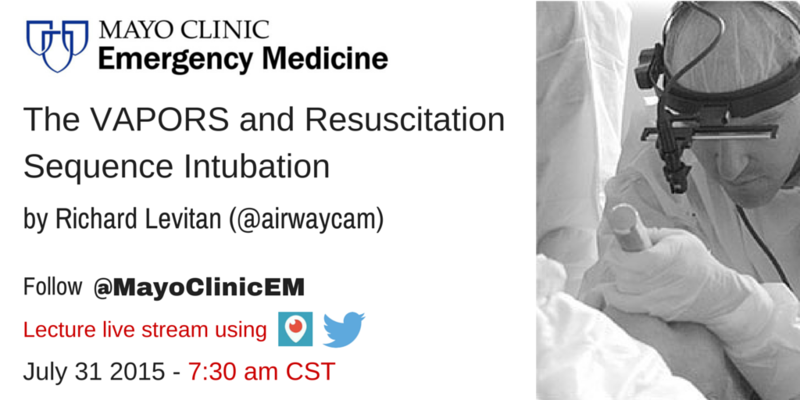 Using Periscope and Twitter, we will live broadcast "The VAPORS and Resuscitation Sequence of Intubation" by Richard Levitan on Friday July 31st at 8am CST. We hope all the world learns and we can become better airwaynauts.